A nightmare, I'd told Tamlin. The painting was a lie. 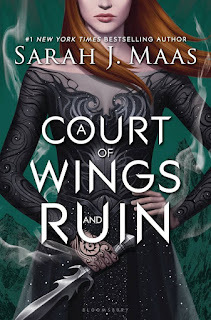 A Court of Wings and Ruin is the third installment in Sarah Maas' A Court of Thorns and Roses series . . .
SHE DID NOT LET ME DOWN. 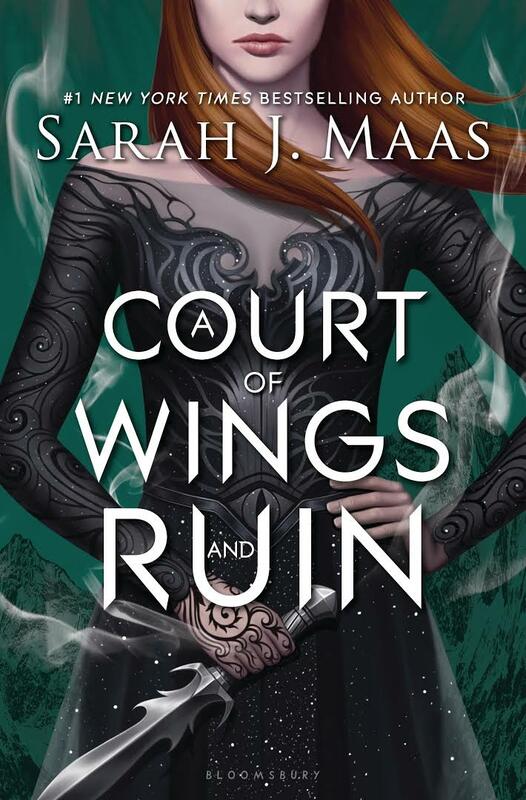 What I loved most about A Court of Wings and Ruin was: the sexytime between Rhysand and Feyre *cough, cough* and the side romantic stories - Azriel and Mor, Cassian and Nesta (my favorite), Azriel and Elain, Elain and Lucien, Amren and Varian. Off-guard does not describe how Amren and Varian caught. They came completely out of left field. I would have never thought Amren having the capacty of harboring romantic feelings for anyone. I mean he barely liked Rhysand and the gang! But a male voice pleaded from behind, "Don't"
Varian appeared from the rocky path, gasping for breath, splattered with blood. Ireally hope Maas writes a story for Cassian and Nesta. They have such a banterific chemistry. And, oh, boy, the tension! Something drew Cassian's attention behind me. And even as his body remained casual, a predatory gleam flickered in his eyes. I didn't need to turn to know who was standing there. "Care to join?" Cassian purred. As well as Lucien and Elain. Although, I have a feeling that is going to be a love triangle for Azriel - Azriel and Elain and Lucien. The plot was suspenseful. Feyre had to balance adjusting to going from human to High Fae, becoming the High Lady of the Night Court, making amends and protecting her newly turn sister, while simultaneously trying to find some semblance of ally-ish between the High Lords of the Courts they can defeat a massive, unstoppable army with the most powerful weapon in the history of history so powerful it is tied to the earth bent of killing and enslaving humans . . .
*pheww* That was a lot to say. A Court of Wings and Ruin pacing was perfectly timed for the story. At no point did I feel the story drag. Maas' writing was as ensnaring as ever! Her writing style for the A Court of Thorns and Roses series just speaks to me on a visceral level. I never wanted the story to end - not in any of the ACOTAR books. All in all, you absolutely have to read A Court of Wings and Ruin. A Court of Thorns and Roses. I bow down to Maas. Usually by the sequel, the story is weakly executed and the characters fall flat. Not in the case of A Court of Wings and Ruin! The characters are more alive than ever! The different personalities meshed so well with each other and the storyline. Feyre - Feyre was sa badass in A Court of Wings and Ruin. She was cunning and clever. She was kind and strong. Unapologetically herself and kickass in combat. We were a black whirlwind of steel and shadow through the clearing, and months of Cassian's brutal training clicked into place as I kept my feet under me. "Tamlin," I got out, but his green eyes narrowed. Run, he seemed to say. that was who had been running alongside us. Trying to find us. This is the part of my review, when trying to selected only a few of my thousand favorite quotes from A Court of Wings and Ruin where I realize most of them involve Cassian and Nesta. That goes to show you how much they stole the show. But Helion gave her the same bow he'd offered me--though his smile was edged with enough sensuality that even my heart raced a bit. No wonder the Lady of Autumn hadn't stood a chance. "I don't think we were introduced properly earlier," he crooned to Nesta. "I'm--"
"I don't care," Nesta said with a snap of her wrist, striding right past him and up to my side. "I'd like a word," she said. "Now." Sarah J. Maas is the author of the New York Times and internationally bestselling Throne of Glass series. A New York City native, Sarah currently lives in Bucks County, Pennsylvania, with her husband and dog.